Black ruby color. 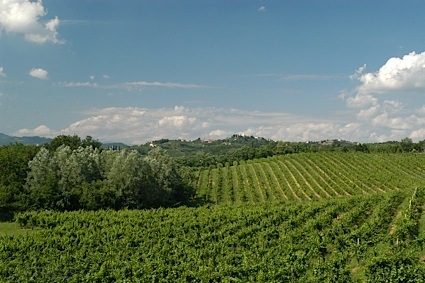 Inviting aromas of baked plums and berries, pastry, vanilla, and spearmint with a slightly chewy, dry-yet-fruity medium-full body and a graceful, interesting, long dark chocolate, egg custard tart, bramble, thyme, and menthol finish with crunchy tannins and moderate oak flavor. A bold Chilean cabernet bursting with fruit, herbs, and creamy oak. Bottom Line: A bold Chilean cabernet bursting with fruit, herbs, and creamy oak. 92 • Balduzzi 2011 "B", Maule Valley 14% (Chile) $35.99. 93 • Balduzzi 2013 Grand Reserve, Maule Valley 14% (Chile) $18.99. 88 • Balduzzi 2014 Reserva, Cabernet Sauvignon, Maule Valley 13.5% (Chile) $11.99. 90 • Balduzzi 2014 Reserva, Carmenère, Maule Valley 13.5% (Chile) $11.99. 86 • Balduzzi 2014 Reserva, Merlot, Maule Valley 13.5% (Chile) $11.99. 82 • Balduzzi 2016 Reserva, Chardonnay, Maule Valley 13% (Chile) $11.99. 90 • Balduzzi 2016 Reserva, Sauvignon Blanc, Maule Valley 13% (Chile) $11.99. 93 • Balduzzi 2014 Estate Bottled Gran Reserve, Maule Valley 14% (Chile) $18.99. 88 • Balduzzi 2014 Gran Reserve, Maule Valley 14% (Chile) $18.99. 92 • Balduzzi 2015 Reserva, Cabernet Sauvignon, Maule Valley 13.5% (Chile) $11.99. 88 • Balduzzi 2015 Reserva, Carmenère, Maule Valley 13.5% (Chile) $11.99. 84 • Balduzzi 2015 Reserva, Merlot, Maule Valley 13.5% (Chile) $11.99. 92 • Balduzzi 2015 Viejo Encachao, Carignan, Maule Valley 14% (Chile) $25.00. 88 • Balduzzi 2015 Gran Reserva, Cabernet Sauvignon, Maule Valley 14% (Chile) $19.99. 90 • Balduzzi 2015 Gran Reserva, Syrah, Maule Valley 14% (Chile) $19.99. 87 • Balduzzi 2017 Reserva, Cabernet Sauvignon, Maule Valley 13.5% (Chile) $12.99. 89 • Balduzzi 2017 Reserva, Carmenère, Maule Valley 13.5% (Chile) $10.99. 91 • Balduzzi 2017 Reserva, Merlot, Maule Valley 13.5% (Chile) $10.99. 84 • Balduzzi 2018 Reserva, Sauvignon Blanc, Maule Valley 13.5% (Chile) $10.99. 86 • Balduzzi 2018 Reserva, Chardonnay, Maule Valley 13% (Chile) $10.99. 88 • La Marina 2014 Reserva, Cabernet Sauvignon, Maule Valley 13% (Chile) $9.99. 93 • La Marina 2014 Reserva, Carmenère, Maule Valley 13% (Chile) $9.99. 90 • La Marina 2016 Reserva, Chardonnay, Maule Valley 13% (Chile) $9.99. 91 • Puroandes 2014 Gran Reserva, Cabernet Sauvignon-Carmenere-Merlot, Maule Valley 14% (Chile) $17.99. 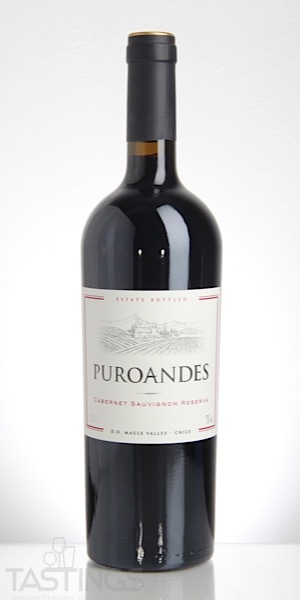 89 • Puroandes 2013 Estate Bottled, Cabernet Sauvignon-Carmenere, Maule Valley 14% (Chile) $34.99. 92 • Puroandes 2016 Reserva, Cabernet Sauvignon, Maule Valley 13.5% (Chile) $10.99. 90 • Puroandes 2016 Reserva, Carmenère, Maule Valley 13.5% (Chile) $10.99. 86 • Puroandes 2018 Reserva, Chardonnay, Maule Valley 13% (Chile) $10.99. 88 • Puroandes 2018 Reserva, Sauvignon Blanc, Maule Valley 13% (Chile) $10.99. Puroandes 2016 Reserva, Cabernet Sauvignon, Maule Valley rating was calculated by tastings.com to be 92 points out of 100 on 12/17/2018. Please note that MSRP may have changed since the date of our review.